← How to convert Word to JPG via command line? How to convert MS Office Excel documents of XLS to PNM? docPrint Document Converter Professional enables you to convert MS Office Excel document of xls to pnm or xlsx to pnm because it is an expert in document converting. If you have never heard of docPrint Document Converter Professional which is also called as docPrint Pro, please go on reading this article. In the following contents, you will also able to get the specific information about how to convert xls to pnm. docPrint Document Converter Professional is a software product that dynamically converts MS Office Excel, PowerPoint, Word, WordPerfect, AutoCAD DWG, PostScript, Adobe Acrobat PDF and many other document types to Adobe Acrobat PDF, PostScript, EPS, XPS, PCL, JPEG, TIFF, PNG, PCX, EMF, WMF, GIF, TGA, PIC, PCD and BMP formats. Three applications are available in docPrint Pro, they are GUI application which is good at batch conversion, command line application which may be a helper to many software developers, the virtual printer application which can be used to save paper and ink. According to different needs, you can choose any application after you download docPrint Pro at http://www.verypdf.com/artprint/docprint_pro_setup.exe and install it on your computer. Deserved to be mentioned here is that the virtual printer application docPrint is not only a Windows printer, it is also a document converter which can convert any printable document to many kinds of graphics. docPrint is easy to use, you just need to print the document to it, which can launch docPrint at once. 1. Please run the printer driver first. You should open the Excel document and click “File”—“Print” to open “Print” dialog box in which you can set “docPrint” as current printer in “Printer” combo box and click “Print” button. You can also use the hot key “Ctrl”+ “P” to open “Print” dialog box. If docPrint has been set as default printer, you should right click the Excel document and click “Print” to directly run docPrint, which can simplify your work. 2. Then you will see the window of docPrint on the screen. Please use one method of the followings to open “Save As” dialog box in which you can save the target files to PNM format and run the conversion from xls to pnm. 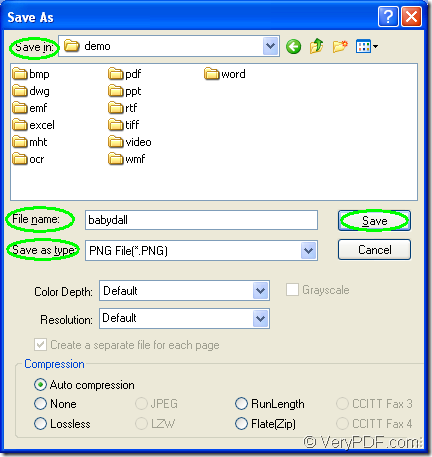 You can click “File”—“Save as” or use the “Save File” button in the toolbar. You can also press “Ctrl”+ “S” combination to open “Save As” dialog box. 3. In popup “Save As” dialog box which is shown in Figure1, you should make the operations to be mentioned below to complete the conversion. Please save the target files in some location or your computer in “Save in” combo box. Input the name of the target file in “File name” edit box. 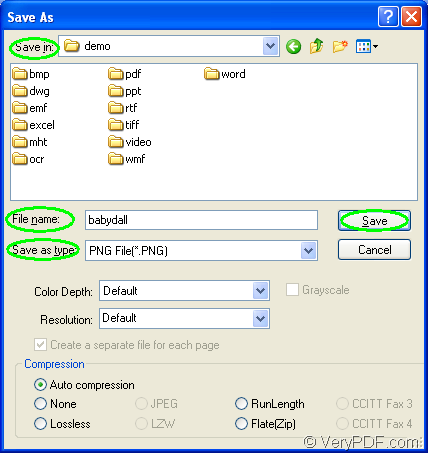 In “Save as type” combo box, please choose the right output format for the target files and then please click “Save” button. Then the conversion from xls to pnm will start and you will get the target files in the specified location until the conversion is over. To read more related articles about docPrint Pro, you can visit the blog VeryPDF Knowledge Base. How to convert documents of Microsoft Office Excel to PNM? This entry was posted in docPrint Pro and tagged xls to pnm. Bookmark the permalink.